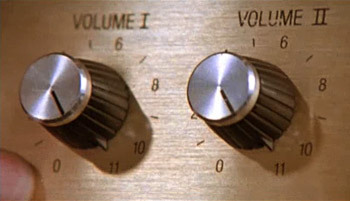 Marty DiBergi: Put [the volume] up to eleven. Exceeding the previous maximum, to an exaggerated degree. For some people more is always better. Exactly what there is more of can vary. More volume, more power, more pretty, more money, more more. Whichever, this trope is about setting a whole new "most" for anything. For those who aren't into electric guitar, "Taking it up to eleven" is a reference to the maximum volume setting on a guitar amplifier. In a nice example of Defictionalization, Marshall came out with an amp that went up to 11, mostly in response to the trope being used in This Is Spın̈al Tap. Later, many Marshall amplifiers began to sport 0-20 volume knobs, essentially taking the trope itself Up To Eleven. Conspicuous Consumption and Absurdly High-Stakes Game often involves this. Not to be confused with Loud of War, The Same, but More. What's the difference between a musician, an engineer, and an entrepreneur? A musician says "This amp goes up to 11!" An engineer says "It has the same amount of power, all they did was add an additional designation to divide that power." An entrepreneur says "For the right price I can get you one that goes up to 12." It also exists as an XKCD strip now. King Kong Bundy has, as a central part of his gimmick, the "five-count". Normal pinfalls go to a three-count; when Bundy pins someone, to show how badly he's beaten them, he holds up a hand and yells "FIVE! ", demanding the referee count to five instead. Big E. Langston also used the five-count gimmick during his NXT run. A fairly common joke on commentary when an opponent gets knocked out cold is that the referee could count to 100 (sometimes even 1000) and the pin would still be successful. There is a game in improvisational theater called "Toppers", which is this trope. Lyrically referenced in one of the choruses of the song "Raise Your Voice" from the musical version of Sister Act. Funny clip from 'This is Spinal Tap' where the musician explains how their special amps go up to 11 instead of just 10.